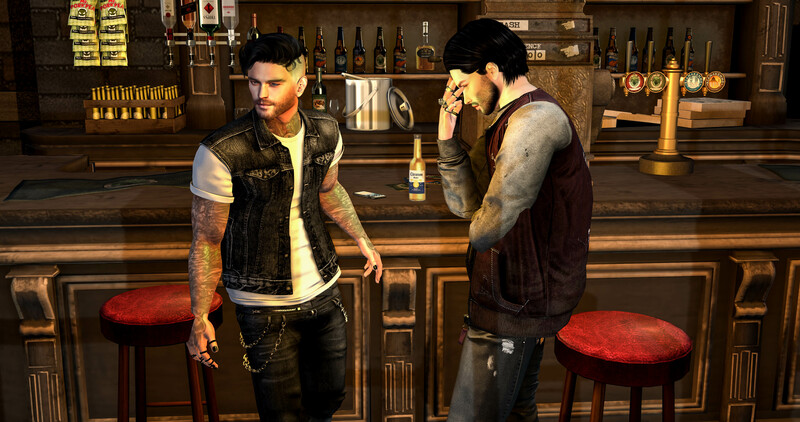 After taking a small breather from shopping, I managed to come up with scene that features items from the Man Cave Event as well as Men Only Monthly. I found everything I needed at those two places to come up with an idea to set to the song “Seein’ Red” by Unwritten Law. 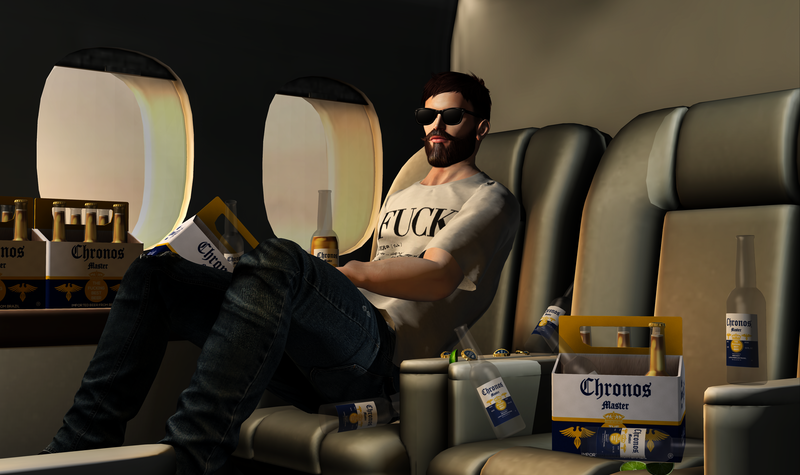 I also have an item from this past weeks Fifty Linden Friday, the “Renegade” hair from Lock & Tuft. It seems lately there is a trend of sweeping mid-length hair hanging off to one side of the head or another and Lock & Tuft have managed to capitalize on it. Of course with it being a bargain it caught my attention but I think even at a regular price it’s worth giving some attention to. The “Ocean Eyes” by GO&SEE are something to behold. The variations of blue and green hues in the 10 colors offered really do depict the differnt types of water you might find in a large body such as an ocean. For those of you with Catwa eyes this truly is a must. Gazing into these could be very dangerous if not mesmerizing. You can find these right now at Men Only Monthly until the 15th of July. Gabriel is offering an outfit that consists of a jacket and slacks at ManCave. The “Denim Zip” Jacket is an open basic styled jacket that fits nicely but I find that what would make it better is an added shirt with a texture HUD to give a little more variety. While it’s fun to walk around without a shirt like you don’t have a care in the world, it limits the amount of places you might want to wear it to. While I am wearing this is Light Gray, you also have 3 other color options to choose from. Coordinating with the jacket are the “Cotton Pants” which are your standard but comfortable casual slacks. Great for going out for a night on the town or getting together with colleagues. There are three colors to choose from (Black, Sand, and White). Both items from Gabriel come with sizes for Belleza, Signature, SLink, and TMP mesh bodies and can be purchased in FATPACKS as well for those that want to mix and match their styles. Completing my casual look are the “Hayan Slip On” shoes from [Z O O M]. These laceless loafer type shoes are a great addition to your wardrobe. They are stylish and come with a HUD that allows you to color change the different parts of the shoe for that extra customization that if you are like me, you are going to love. I’m wearing the Signature version but also included are a SLink version as well as Unrigged for those of you with different mesh body choices. One of my fave items I picked up at Man Cave is the “Bathroom Pub Outside” backdrop by 220mL. It is a product by a brand that I’ve seen nothing but quality out of and I’ve used others and have nothing but good things to say. The textures and build give you that feeling as if you are actually standing outside the bathroom at a pub and in the case of this scene, waiting to catch someone in the act of doing something dubious. Props like this have somewhat changed my mind on using them compared to visiting a sim with pre-built settings. I’m becoming a photographer that is split 50/50 on this topic because of well made items like this. I encourage you to visit these events and the stores featured and grab demos and find what suits you best. Enjoy the full style credits below and happy shopping. Until next time as always, stay stylish fellas!